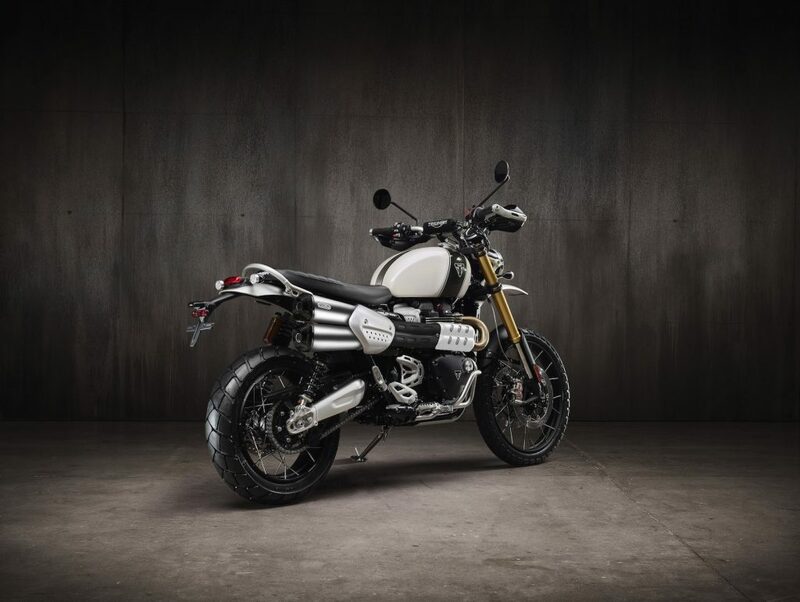 With the upcoming kickoff of the Scrambler 1200, Triumph decided it needed to really get people excited about the bike. The company released two Inspiration Kits for the new motorcycle. These will help make your Scrambler 1200 feel special. There are two kits: Escape and Extreme. Both offer a unique take on what the Scrambler 1200 can become. The Escape Inspiration Kit is focused on turning the bike into a touring motorcycle that will gobble up the miles with aplomb. The Extreme Inspiration Kit increases the off-road prowess of the mildly capable Scrambler. As I mentioned above, this kit is all about taking the Scambler 1200 and turning it into a more capable touring machine. The equipment included with the kit should help do this while also giving it a little visual flair. The kit includes a rugged pannier and fitting kit, handguards, grab rack kit, LED fog lamps, center stand, and a flyscreen with the mounting bits needed. While this equipment should help make it a better tourer, it won’t absolutely transform the motorcycle. You’ll still be able to enjoy the bike for what it is. If you want to take your Scrambler 1200 the other way, then the Extreme Inspiration Kit is for you. Its focus is on making the Scrambler a more legit off-road machine. In order to do this, Triumph had to add a bit more equipment than it did for the Escape kit.